I fell in love the campground piece of patterned paper, and wanted to make sure that I incorporated it into my layout! I added a 3 X 12 inch piece at the bottom and I also added a 3 X 12 inch piece of the bear necessities piece of patterned paper at the top. In the middle of the layout I added a 6 X 12 piece of happy camper piece of patterned paper. These three pieces were the base of my layout. I then started to add the embellishments and photos. I added a limeade doily and layered on top some stickers from the Icon Sticker sheet... I LOVE all the critters on this sheet! I then used four of the fancy frills stickers from this collection to add some interest to the top and bottom of the layout. Finally I added a few extra touches from the This & That Sticker Sheet. Hope you enjoyed my Happy Camper Project today! Hello, everyone! 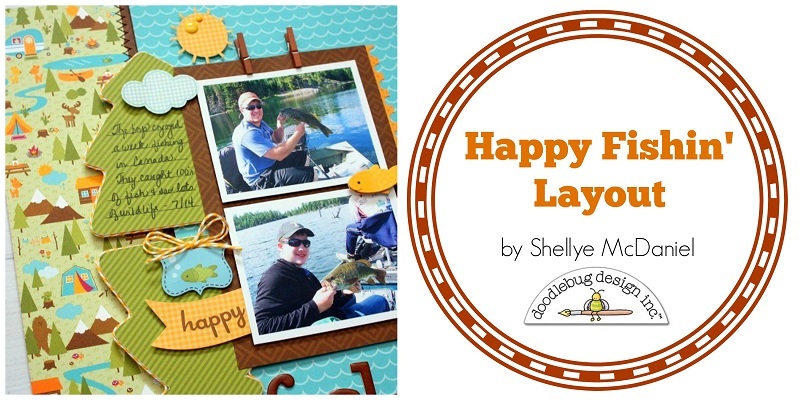 Shellye here today with a "Happy Campers" Layout. One thing that I love about being on the water is seeing the reflection of the trees, mountains, etc. in it! I had two chipboard trees on hand, so I dressed those up in patterned paper and used them as an accent similar to a reflection upon the water. The top tree was a great space for journaling. I used two of the new Mini Clothespins at the top of the photo strip so that it appears that the pictures are hanging. the new Chippers adhesive alphabet stickers! Both of these are ADORABLE! Jodi & Shellye, you rocked this one! Wow, this is to cute! LOVE it. Sharing on FB, this collection is just so awesome. What cute LO's and projects! These are cute layouts! This collection is so pretty. So loved the fishing layout! I shared on Facebook! These are adorable! I just love the cute little animals!! Fabulous layouts, love the pictures on the layouts. All of the details are wonderful! Fun layouts, love all of the embellishments and details! I pinned the bear layout. I pinned the fishing layout. Love them both so I pinned them both! THANK YOU for sharing your HAPPY Happy Camper layouts!!! Oh my gosh! These pictures are perfect for this collection! Such fun layouts! Love them!!! 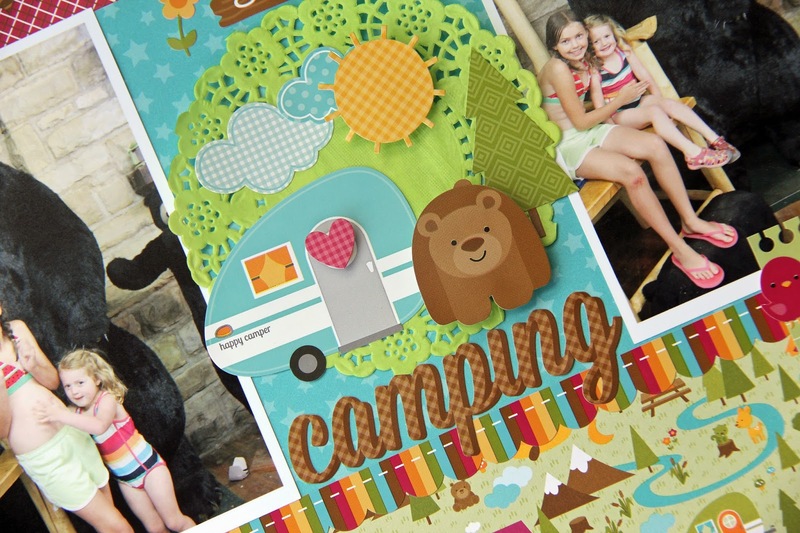 I pinned a product pic of the campground double-sided cardstock that Jodi used on her layout, along with a link to her layout (this blog post). I pinned the "Fishing" layout to my Scrabook pages and layouts board on Pinterest! 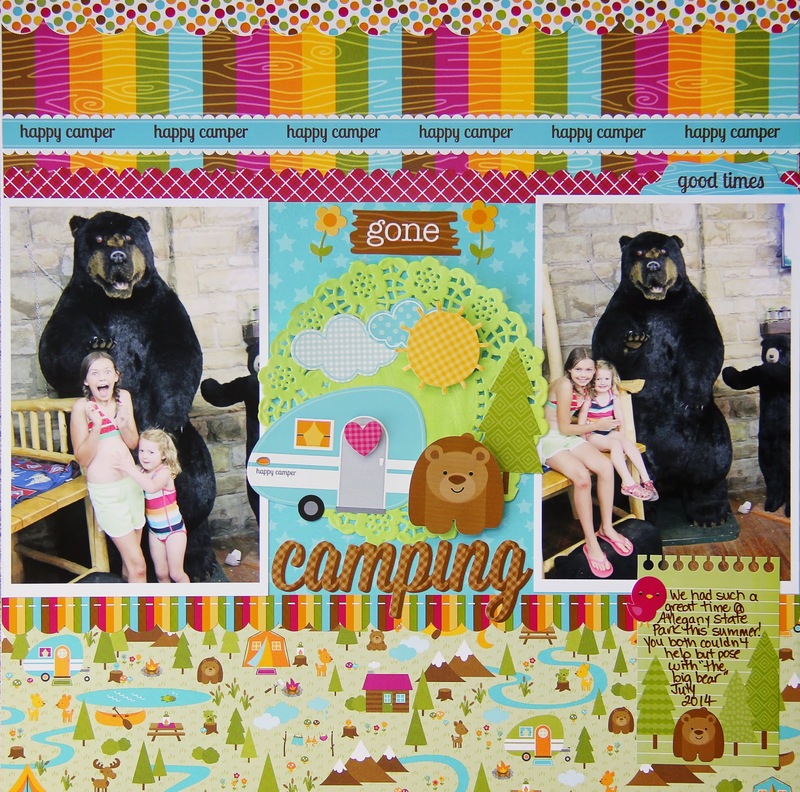 I pinned the "Gone Camping" layout on my Scrapbook pages and Layouts on Pinterest! throug the Doodlebug FaceBook page! So amazing - both layouts!!! I love this collection so much!! I shared on facebook!! Love both these layouts - so cool!!! Shared on facebook! !